I created an buildout from the Plone corebot Github repository. I used the current development version 5.2 and run it on a Python 3.6.5 virtual environment. The buildout of the Plone instance took some time, but everything went well and I could create a new Plone site. I added the multilanguage addon to it and played a bit with the site. I added second language to the site, created a new page and tested the translation framework that came with the addon. It worked as expected and I got a page with a linked translation. 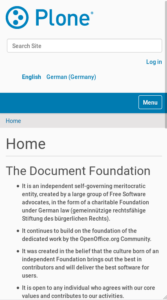 Then I tried out how the website of the Documentation would look like in a pure (not specially branded) Plone environment. I did a quick and dirty copy and paste of the homepage of TDF and the new Plone page was done in 1 minute. The page uses the default Plone layout and there were no issues with different screen size.